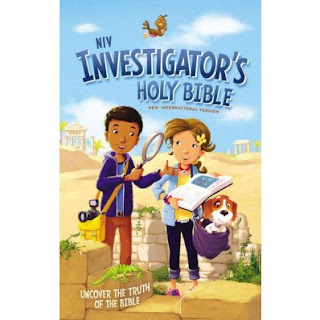 Bible Review- "NIV Investigator's Holy Bible"
Have you ever used a magnifying glass? It makes everything bigger and easier to see, right? Detectives and scientists magnify things to understand them better. Well, that’s just what this Bible does—it’s a magnifying glass to help children understand the Word of God better. Thanks Zondervan for sending me this Bible in exchange for an honest review. I was not paid for this review and all opinions expressed are 100% mine. Here is the real deal... If we don't give good facts and truth to our kids our world will tell them lies. These lies tend to cause havoc on our belief system. We need to do a better job and giving our kids opportunities to explore and investigate God's word and know the TRUTH! I love Bibles that have tough questions to read and go over. I remember as a kid always looking through my bible at those little snippets and learning so much. I would page through just reading the extras in the Bible. My favorite feature is the "evidence" as this section will build boldness in our kids! It will help them get the facts they need to know to share more and be confident in JESUS!! This is a super fun Bible and the language is easier for kids to understand. The recommended age is 6-10 however I think even many adults would enjoy this!